Memories made for every moment is as fast-flowing as the waters. You should never let anything pass by go unnoticed, or taken for granted, for flowing waters never pass our feet twice. Likewise, with memories, each should be cherished, for it would never come your way again. Let’s make memories that would be unforgettable for the New Year. Being happy is contagious. However, sadness would never do good to influence others, so work up a smile and make others happy. May you have a warm, happy, and prosperous New Year ahead of you! I know that this will be the year that you will see your dreams come true. May you have a time that is full of fragrant roses wafting your way, with the wonderful lights of the world that would illuminate your year. I wish you a year that is full of blessings, success, and good health. Leave or the past worries behind and let us star planning a great future ahead of us. Have a blast this New Year! Every passing year would take away every trouble and problem that came your way. 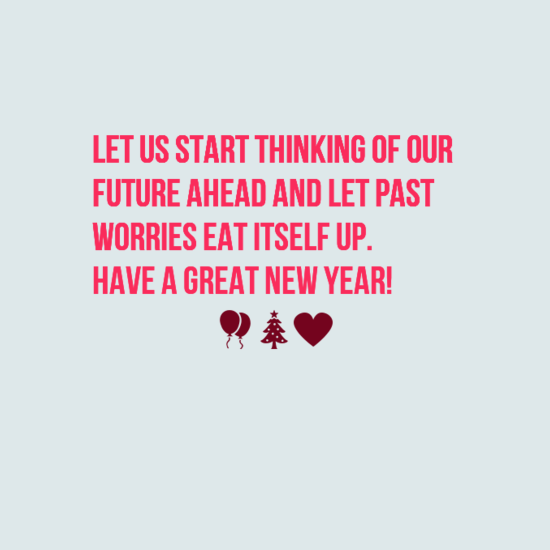 Let us start thinking of our future ahead and let past worries eat itself up. Have a great New Year! Cheers to all the hope and promises the New Year brings! May a shower of success and joy come your way for this year. 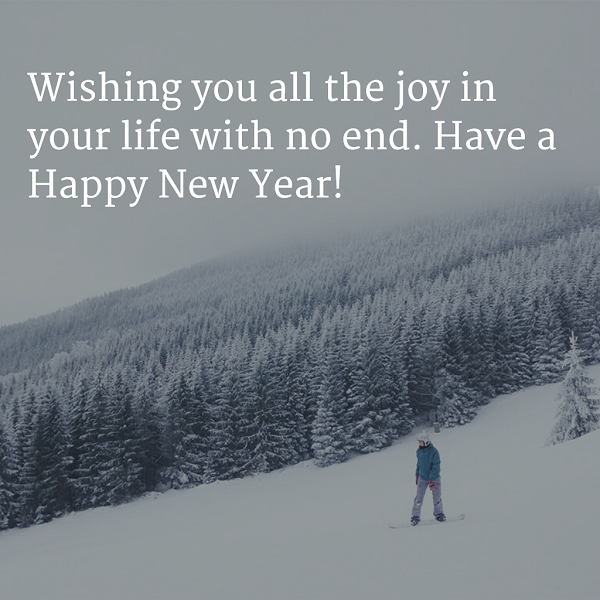 Wishing you all the joy in your life with no end. Have a Happy New Year! Joy to your heart and warmth to your home! 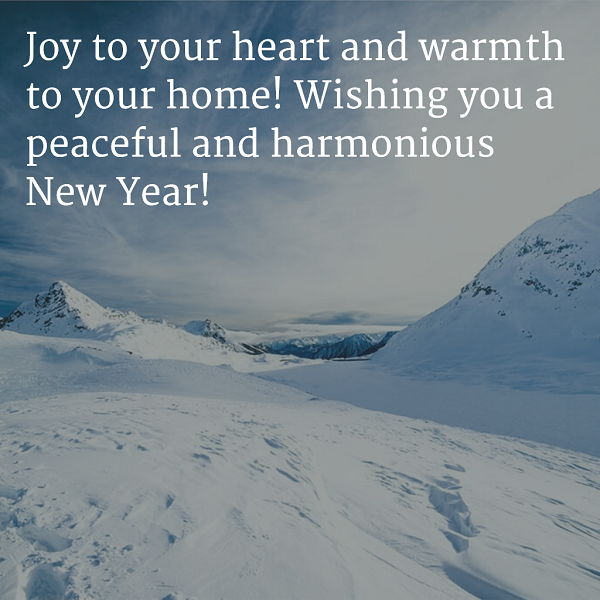 Wishing you a peaceful and harmonious year! Our spirits, resolutions, hopes, and aspirations are all brand new at the start of the year. I wish you a promising and bountiful New Year! I wish that the upcoming year would be heartfelt and prosperous to you. May the year reward you the realization of your endeavors. Here’s to hoping that each day of the New Year would bring sweet surprises and good cheer to you and your loved ones. Wishing you a blessed year full of happiness! Let the spirit of forgiveness reign in our hearts in the coming New Year. Leave all the bad memories behind and let’s start making new and cheerful ones. Let’s forgive and forget. The season may be icy and cold, but let my warm greetings enter your household and your hearts. I wish you all the best in wonderful future that awaits you! I hope the new year would bring you more love from your loved ones! Have a memorable time! For a beautiful person should equally have a beautiful year to come. Wishing you a splendid and cheerful Year! Wishing that the joyful spirit of New Year would enter your home and bring good tidings. May it keep your hearts glowing with peace and happiness forever! A healthy dose of courage, faith, and hope is all I ever wish for you to overcome the obstacles and challenges that may hinder your way to your much-deserved success. May the New Year bring you promises of a bright future. Best wishes to you and to your family! As the New Year approaches, I wish that you would have peace, new friends, and an abundance of blessings. God bless you this Upcoming Year! There is no changing the past and you can’t bring back time. But look forward on your future and see bright prospects ahead of you. Upcoming Year is another great opportunity to add to your successes. There is nothing like the traditional New Year’s resolutions and the much more traditional breaking of it. Here’s to years of making and breaking resolutions with you. For past actions belong to the past year and new voices need fresh faces. Cheers to making something end so we can start another beginning. Let’s toast the New Year! 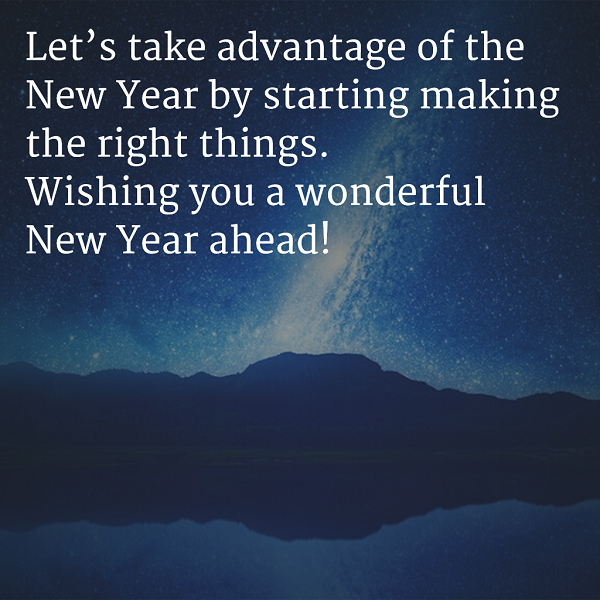 Let’s take advantage of the New Year by starting making the right things. 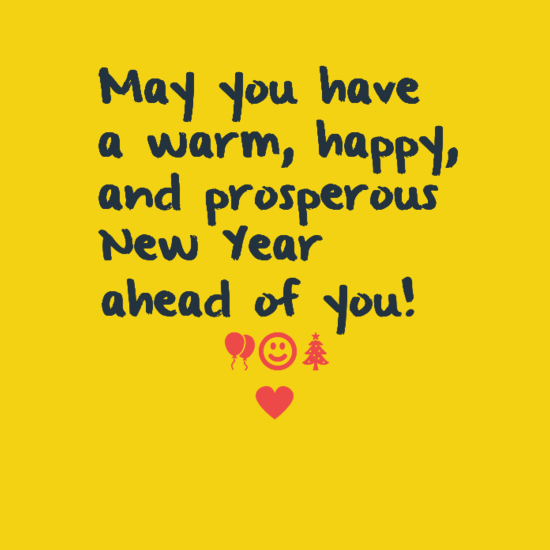 Wishing you a wonderful Upcoming Year ahead! You must maintain that every day is the best day in the year, and have it tattooed to your heart. Only then would it be realized. Start making enemies with your vices and making peace with your neighbors. Let every year come to make you a better person than you already are. Some of us forget the weight of 365 days that has brought a great deal of something into our lives. Let us not forget now that another round of 365 days are coming round the corner, and let’s begin to cherish it and use it perfectly. Happy New Year to all of us! The New Year brings a lot of promises of new friends, new adventures, and new surprises. Happiest Year to you! The famous countdown to midnight and obligatory fireworks are what makes each New Year’s Eve celebration special. Hoping that I would get to spend it with you. Every New Year we go through our roomful of mistakes and think about how to set things right. This New Year, however, let us start by going through our potentials for a change. Every start of the year is like a blank first page to every book. Write down a good one. It is time to unfold new horizons and rejoice in the simple pleasures of life. Have a fulfilling 2016! We always look back at the warm memories we had at the end of every year. Believe me when I say that you have had a hand in every warm memory that I have. I wish you a Happy New Year, hoping that a lot of blessings would be showered upon you for the year to come. May you have happiness all year through, so let’s do the out with the old and in with the new! Happiest Year Ever! I am constantly thinking about our friendship and how it has made us both so happy. I wish it would be the same and better this New Year! Have a happy one! You have made me joyful these past years and I wish for much joy in return to you. With you as a friend my life has improved greatly. As we enter another year may you also receive the love you have given me. Have a joyous New Year! Whenever I count my blessings I never forget to wish that you would have more. Enjoy this Year and whatever’s in store. You have never failed to make my every day a special occasion. Now that another year has ended, I wish that you would continue to weave happy memories and sweet moments with me. Have a great year ahead of you. Happy New Year, my love. All New Year wishes that I had came true when heaven gave you. Wishing you times full of love, sweetheart. As we welcome the new year together, let us cherish the love that we shared and allow it to grow even deeper. It is indeed a Happy Year with you by my side. You still laugh at my bad jokes and helped me up whenever I fall. I love you even more because of that. Best year ever, love. Instead of wasting my resolutions on me and never fulfilling them, I’ll use it to return to you all the love and warmth you have shown me. 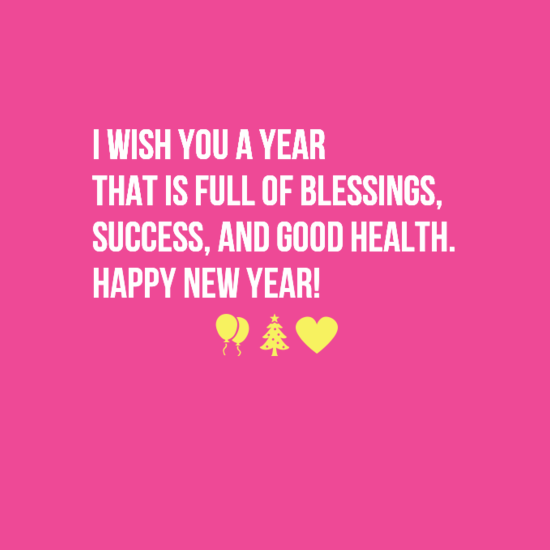 I wish to share all the new experiences, new joys, and new hopes that I will have this year with my new love. Have a very happy New Year! Wishing my beloved friend a fabulous year ahead. May the beacon of happiness shine its light above you. May the wreath of peace encircle your household. And may a cloud of love descend upon your home for the entire year. Happiest New Year to you! Another year has come and passed, yet you are still here by my side. I wish that for each and every New Year all your dreams and wishes would be realized. May God shower his love and care upon you. For this coming New Year, I wish for you, dear sister, all the blessings that you rightly deserve. I love you and Happy New Year, Sis. Every day for every year you have brightened up my life. I wish that you would have a New Year that is as bright as the light you shone upon me. Happy New Year Grandma. Thank you for being a constant fixture in my life. We have had fun and embarrassing memories together each year. Let us make it a point to do it again for this New Year! For this New Year, I give you all my hopes, all my dreams, and most especially, all my love. As ever New Year approaches, I always think about the gifts that God have given me and how grateful I am for these. These gifts are none other than you, my beloved and much trusted family and friends. Let us all have a wonderful New Year together!